On Tuesday of this week, the boys FAI 5 A Side soccer competition took place in the MDL in Navan. Slane were drawn in a group with Gaelscoil na Ríthe, Carnaross, Bohermeen and progressed from the group. 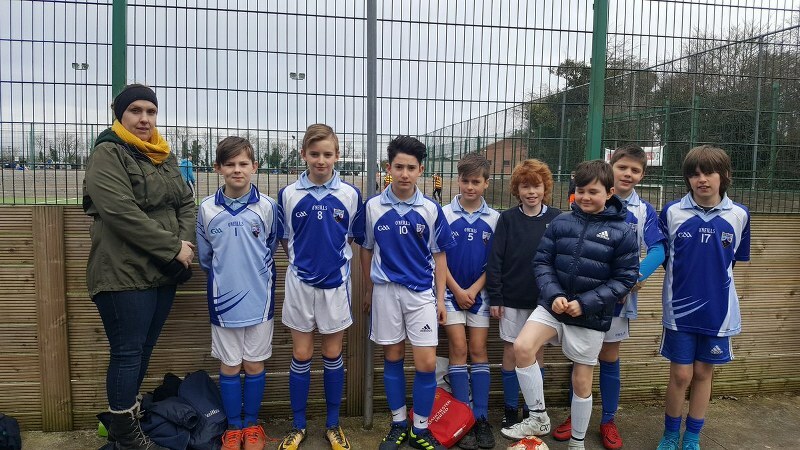 They then had to compete in a playoff match against Gaelscoil na Ríthe, Dún Seachlainn for a place on finals day in April. The final match was a very tense affair with Slane NS twice coming from behind to draw the game 2-2. Halfway through the five minutes of extra time, Altay Guneyer scored the winning goal and Slane held on for victory. The standard of soccer from both teams was excellent with the Gaelscoil na Ríthe keeper in particular pulling off some fantastic saves. The team now returns on Wednesday the 11th of April for finals day. Thank you to the parents who came to support the team and to Sabrina Galvin for assisting on the day.